Students at JA have abundant ways to build a rewarding life found in serving God and others. Chapel, Bible elective, mentoring, service, and initiating small groups are opportunities students can find here. Chaplain John Hugh Tate sees potential for students to develop additional mentoring and small group relationships in the JA community, too. 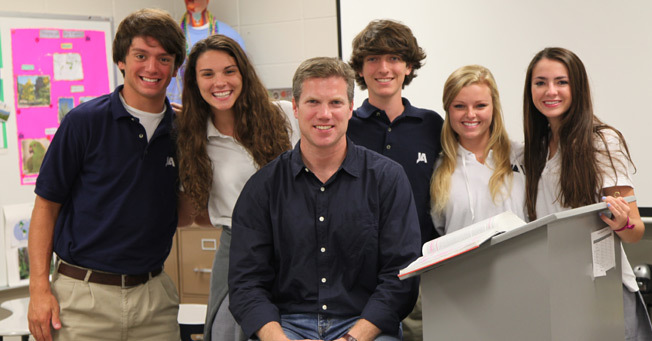 An Upper School elective is offered this year entitled, “A Biblical Worldview in a 21st Century World.” In the class, students explore what it means to see the present world from a “Christian worldview” and how that view affects the way individuals think about current issues, events, and debates. “Right now, we’re going over the main beliefs of a Christian worldview, and we’re about to transition to the world today and issues we talk about around the dinner table (i.e., government, war, family life, etc. ),” he said. The Rev. Tate and his wife, Linda, moved to Jackson in 2004, and later enrolled their first child, who is now in first grade, at JA. Prior to entering the ministry, he worked in Washington, D.C., for Senator Thad Cochran and then Congressman (now Senator) Roger Wicker. After Divinity school, he returned to Mississippi where he was associate pastor at Christ United Methodist Church. He currently pastors Bellwether Church in Jackson. Rev. Tate holds a bachelor’s degree from The University of Mississippi, a master’s degree from University of Queensland, and a Master of Divinity from Harvard University.